These cupcakes are so elegant. It’s the wavy flags that do it. Photo by Kate Mathis Styled by Chiara Alberetti Milott. These are definitely really beautiful. the flags are incredible. So sweet. Those flags are indeed the needed touch. I’m hungry now! Oooh, these are the perfect start to my morning. 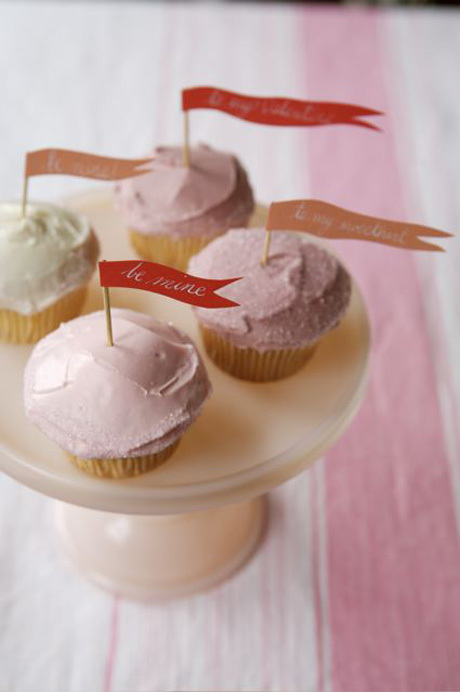 Makes me want to bake pretty pastel cupcakes with tiny banners for dessert tonight! Those flags are so pretty! cute little flags are such a great way to send/say a little message! i am craving cupcakes today! yum, they look too good to eat! Little toothpick flags/labels make everything look better. those are great – very Royal Tenenbaums! mouthwatering treats!! can’t handle it.